Crop: The name of the crop will go here, and by clicking on the name, you can see a picture of what it looks like. Level: The level you need to grow the crop will go here. Seeds: Look here to find a picture of the Seeds when there are 1, 2, 3, 4, 5, or more of them. Payment: You can pay a Farmer to look after most of your crops, so that they won't die. The required payment will go here along with a picture of it. 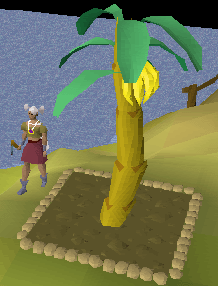 Yield: Once you've grown the crop, you will be able to pick something such as Coconuts from a Palm Tree, and that yield will be stated here. Growth Time: Different Crops take different amounts of time to grow, so the time it takes to grow (without disease or other problems) will go here. Experience: As with Growth Time, the experience you get varies from crop to crop, so that will go here. Pros: All Crops have something good about them to put here! Cons: All Crops have something bad about them to put here! 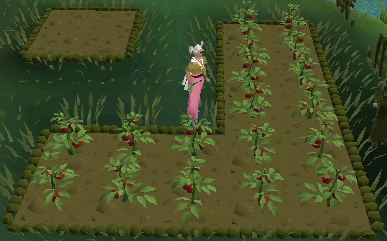 The Allotment Crops are the Crops that you are likely to have to grow early on in your Farming career, and certain ones such as Herbs may be grown all the way to level 99 and beyond! Pros: The Seeds are cheap, making it a fairly inexpensive way to level. They can also be grown right from level 1. Cons: Since they require such as low level to use, the experience isn't wonderful, and the Potatoes are just about unsellable, so you'll be unable to get back the cost of the Seeds. Pros: The Seeds are cheap, making it a fairly inexpensive way to level. They can also be grown at a fairly low level. Cons: Since they require such as low level to use, the experience isn't wonderful, and the Onions are just about unsellable, so you'll be unable to get back the cost of the Seeds. Pros: The Seeds are fairly cheap. Cons: Since they require such as low level to use, the experience isn't wonderful, and the Cabbages are just about unsellable, so you'll be unable to get back the cost of the Seeds, although there are a number of people around who take pride in collecting large numbers of Cabbages! 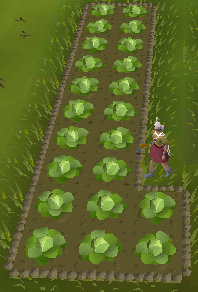 Pros: If you are going to plant them in the Falador Allotment, there is a Cabbage field just next to it to get the Farmer Payment easily. Cons: Since they require such as low level to use, the experience isn't wonderful, and the Tomatoes are just about unsellable, so you'll be unable to get back the cost of the Seeds. Tomato Seeds are also significantly more expensive than Potato, Onion and Cabbage Seeds. 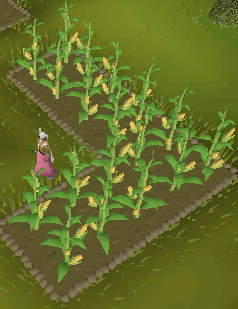 Pros: Unlike the lower level Vegetables, there is a small market for Sweetcorn, so you may actually be able to sell them! Cons: The Seeds are once again, on the rise in price, and Sweetcorn can fill up your inventory quickly when harvesting. Pros: If you have completed Recipe for Disaster, Cooking Apples are very easy to obtain as payment by buying them from the Culinaromancers' Chest. Baskets of Strawberries will also heal a large amount of health, so there is a reasonable demand for them. Cons: The Seeds are relatively expensive in the first place. Pros: The experience is considerably better than any of the other Fruit and Veg that can be planted in an Allotment. Can be used to make Supercompost. Cons: The Seeds themselves will cost you several thousand gp each, and, as with all other Fruit and Veg Allotment Crops, you need 3 Seeds to plant them, so losses will once again appear. Pros: Will protect Onions, Potatoes and Tomatoes from disease. Used as a secondary item for creating a Bull Ant Pouch. Cons: They are the lowest level Flower, so provide least experience. Pros: Protects Cabbage from disease. Cons: Once you pick them, they are good for little other than dropping on the floor. 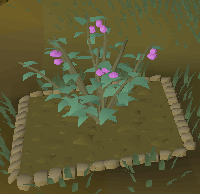 Pros: Give slightly more experience than Nasturtiums and are used in certain Quests. Cons: About as useful as a Shrimp to a Kalphite Queen hunter. Pros: The Seeds cost considerably less than the 3 Limpwurt Roots that cane be picked once it is fully grown, so a profit can be made. 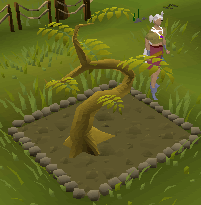 It is also a good way to get Limpwurt Roots for Herblore. Cons: Limpwurt Roots don't stack, so your inventory can fill up with them fairly quickly. Pros: Protects crops in the allotment from disease. 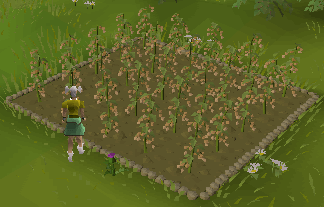 Cons: You need to have completed all Falador Tasks to obtain them and then only get one seed for every Mole Skin you give to Wyson. 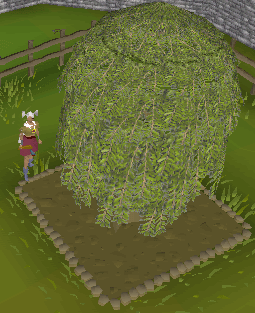 Pros: Is a great source of Herbs for Herblore. Cons: Herbs don't stack, so if you are visiting multiple Patches, you'll need to Bank between to free some inventory space. Pros: Is a great source of Herbs for Herblore. Due to the high cost of the Herb, and fairly low cost of the Seed, you can make quite a bit of money by growing lots of these. 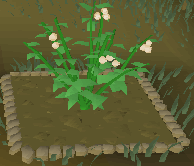 Pros: This herb is needed to make a Summoning Potion. Cons: Herbs don't stack, so if you are visiting multiple Patches, you'll need to Bank between to free some inventory space. The seeds are a very uncommon monster drop. Pros: Is a great source of Herbs for Herblore. Due to the fairly high cost of the Herb, and very low cost of the Seed, you can make quite a bit of money by growing lots of these. 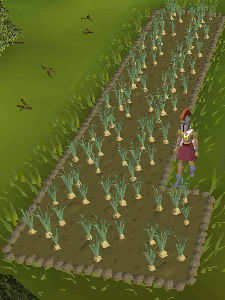 Pros: Is a great source of Herbs for Herblore. Due to the fairly high cost of the Herb, and low cost of the Seed, you can make quite a bit of money by growing lots of these. Pros: Is a great source of Herbs for Herblore. Due to the high cost of the Herb, and fairly low cost of the Seed, you can make quite a bit of money by growing lots of these. The experience is also reasonably good. 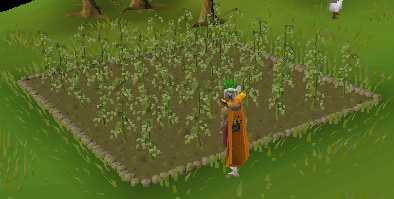 Pros: Is a great source of Herbs for Herblore. Due to the fairly high cost of the Herb, and low cost of the Seed, you can make quite a bit of money by growing lots of these. The experience is also reasonably good. Pros: Is a great source of Herbs for Herblore. Due to the fairly high cost of the Herb, and low cost of the Seed, you can make quite a bit of money by growing lots of these. The experience is also reasonably good. 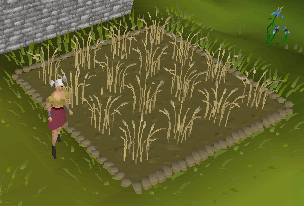 It is the highest level crop that it is possible to grow with the Farming Skill. 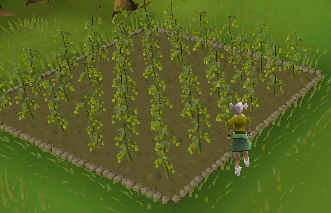 Hops are the things that are required to Brew different alcoholic beverages, and can be grown from level 3 Farming. Pros: Is another crop to speed up Farming slightly at lower levels. Cons: Hops don't stack, so if you are visiting multiple Patches, you'll need to Bank between to free some inventory space. Pros: Is another crop to speed up Farming slightly at lower levels. Used to Brew Dwarven Stout. Pros: Is another crop to speed up Farming slightly at lower levels. Used to Brew Asgarnian Ale. Pros: Used to Brew Wizard's Mind Bombs. If you have completed Recipe for Disaster, Tomatoes are very easy to obtain as payment by buying them from the Culinaromancers' Chest. Pros: Used to Brew Dragon's Bitter. Pros: Used to Brew Slayer's Respite. Bushes are the sorts of things that are used to grow Berries on, varying from the rather useless Cadavaberries to the highly coveted Whiteberries. 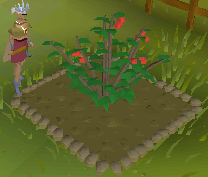 Pros: After checking its Health, and picking the Berries, you can leave it for a while and let more Berries grow without needing to plant a new Bush. Cons: You only get a very small number of Berries off each Bush at a time. Pros: After checking its Health, and picking the Berries, you can leave it for a while and let more Berries grow without needing to plant a new Bush. If you have completed Recipe for Disaster, Tomatoes are very easy to obtain as payment by buying them from the Culinaromancers' Chest. Cons: You only get a very small number of Berries off each Bush at a time. Baskets of Strawberries can be a pain to obtain. Pros: After checking its Health, and picking the Berries, you can leave it for a while and let more Berries grow without needing to plant a new Bush. Can be used to make Supercompost. Pros: After checking its Health, and picking the Berries, you can leave it for a while and let more Berries grow without needing to plant a new Bush. 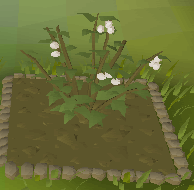 The only other 'easy' way to get Whiteberries is by taking them from one of the spawn points. Pros: After checking its Health, and picking the Berries, you can leave it for a while and let more Berries grow without needing to plant a new Bush. It is the best sort of Bush that can be planted. Can be used to make Supercompost. They can never get diseased. Allotments, Bushes and Hops are fine up to a point, but in reality are actually fairly slow experience. If you want to get experience of any reasonable speed, you'll need to plant Trees, whether they be Wood or Fruit Trees. Plant Seeds one day, pay the Farmer to watch them, come back the next day and find 50,000 experience or more waiting for you. Luxury! 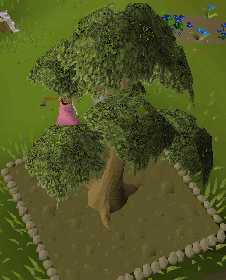 Pros: Trees offer huge amounts of experience for very little effort - plant, pay Farmer to watch, come back later and find masses of experience waiting for you. 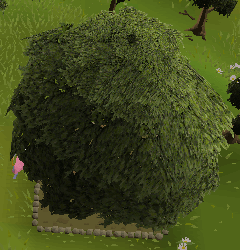 You can cut them down to get Logs which can then give you either Firemaking or Fletching experience on top of the Woodcutting experience for cutting them down. If you have completed Recipe for Disaster, Tomatoes are very easy to obtain as payment by buying them from the Culinaromancers' Chest. Cons: Trees can cost a huge amount of money if you want to get a high level. You need to plant them in a Plant Pot first to let them become a Sapling, which takes a few minutes. Pros: Trees offer huge amounts of experience for very little effort - plant, pay Farmer to watch, come back later and find masses of experience waiting for you. 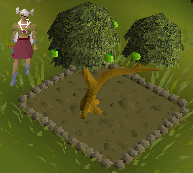 You can cut them down to get Logs which can then give you either Firemaking or Fletching experience on top of the Woodcutting experience for cutting them down. If you have completed Recipe for Disaster, Cooking Apples are very easy to obtain as payment by buying them from the Culinaromancers' Chest. Pros: Trees offer huge amounts of experience for very little effort - plant, pay Farmer to watch, come back later and find masses of experience waiting for you. 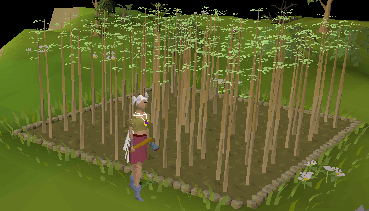 You can cut them down to get Logs which can then give you either Firemaking or Fletching experience on top of the Woodcutting experience for cutting them down. Pros: Trees offer huge amounts of experience for very little effort - plant, pay Farmer to watch, come back later and find masses of experience waiting for you. 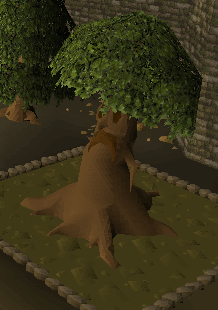 You can cut them down to get Logs which can then give you either Firemaking or Fletching experience on top of the Woodcutting experience for cutting them down. Magic Roots can be used to make a Nature Amulet. The Magic Tree is the highest level Wood Tree that can be grown. Like Wood Trees, Fruit Trees will give you massive amounts of experience, and should be used if you wish to go far with Farming. Pros: Trees offer huge amounts of experience for very little effort - plant, pay Farmer to watch, come back later and find masses of experience waiting for you. After checking its Health, and picking the Fruit, you can leave it for a while and let more Fruit grow without needing to plant a new Tree. 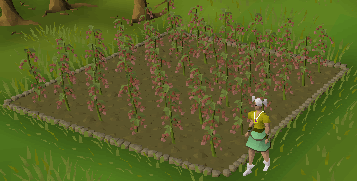 The seeds can be bought very cheaply from the Grand Exchange. Cons: You need to plant them in a Plant Pot first to let them become a Sapling, which takes a few minutes. It will only grow 6 Fruit at a time. Sweetcorn can be a pain to get hold of. Pros: Trees offer huge amounts of experience for very little effort - plant, pay Farmer to watch, come back later and find masses of experience waiting for you. After checking its Health, and picking the Fruit, you can leave it for a while and let more Fruit grow without needing to plant a new Tree. If you have completed Recipe for Disaster, Cooking Apples are very easy to obtain as payment by buying them from the Culinaromancers' Chest. 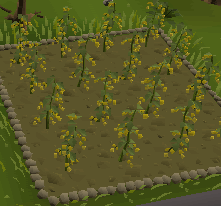 The seeds can be bought very cheaply from the Grand Exchange. Cons: You need to plant them in a Plant Pot first to let them become a Sapling, which takes a few minutes. It will only grow 6 Fruit at a time. Cons: You need to plant them in a Plant Pot first to let them become a Sapling, which takes a few minutes. It will only grow 6 Fruit at a time. 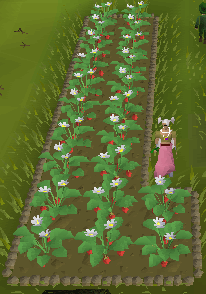 Baskets of Strawberries can be a pain to obtain. Pros: Trees offer huge amounts of experience for very little effort - plant, pay Farmer to watch, come back later and find masses of experience waiting for you. After checking its Health, and picking the Fruit, you can leave it for a while and let more Fruit grow without needing to plant a new Tree. Baskets of Bananas can be obtained fairly easily from the Food Shop on Ape Atoll or by picking Bananas from Trees on Musa Point. Cons: Trees can cost a huge amount of money if you want to get a high level. You need to plant them in a Plant Pot first to let them become a Sapling, which takes a few minutes. It will only grow 6 Fruit at a time. 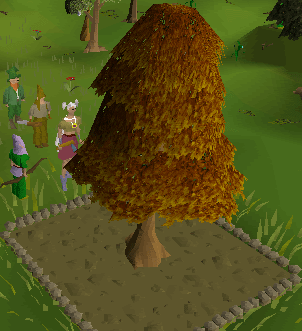 Pros: Trees offer huge amounts of experience for very little effort - plant, pay Farmer to watch, come back later and find masses of experience waiting for you. After checking its Health, and picking the Fruit, you can leave it for a while and let more Fruit grow without needing to plant a new Tree. Can be used to make Supercompost. Cons: Trees can cost a huge amount of money if you want to get a high level. You need to plant them in a Plant Pot first to let them become a Sapling, which takes a few minutes. It will only grow 6 Fruit at a time. 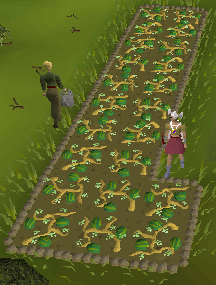 Watermelons can be a pain to obtain unless bought on the Grand Exchange. 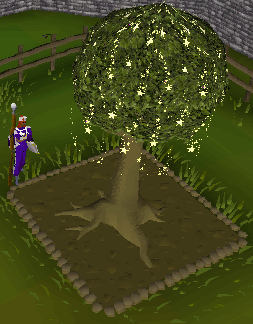 Pros: Trees offer huge amounts of experience for very little effort - plant, pay Farmer to watch, come back later and find masses of experience waiting for you. After checking its Health, and picking the Fruit, you can leave it for a while and let more Fruit grow without needing to plant a new Tree. 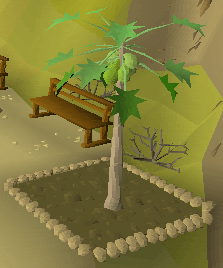 Pineapples can easily be picked in the area around the Brimhaven POH Portal as well as being bought and banked in the Grand Tree. Used in Hunting to catch Pawya. Pros: Trees offer huge amounts of experience for very little effort - plant, pay Farmer to watch, come back later and find masses of experience waiting for you. After checking its Health, and picking the Fruit, you can leave it for a while and let more Fruit grow without needing to plant a new Tree. 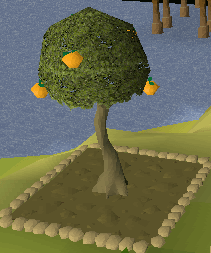 This is the highest level Fruit Tree there is to grow. As well as the normal crops, there are others that don't fit into the wider categories and are classed as 'Special' instead. Pros: No compost is required. 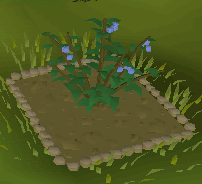 They grow very quickly, so you can get several by heading to the patch with multiple seeds and alching while they grow to stop yourself having to do nothing. They can be used for Summoning or eaten in 3 bites, healing 60 Life Points per bite. Cons: You only get one Evil Turnip per seed. 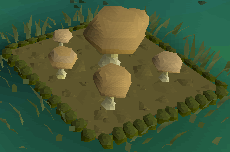 Pros: There is a Fairy Ring next o the Patch for fairly easy access. Cons: The Mushrooms have little use other than as payment for Whiteberry Bushes. Pros: Doesn't cost anything since you can get new Seeds from Horacio or by killing the overgrown Vine. 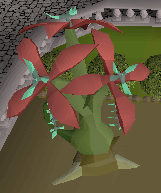 It also gives 2500 Slayer experience upon killing the Vine. If you don't want to kill it, you can get Horacio to dig it up for you. Cons: You must have completed the Back to My Roots Quest to be able to plant it. 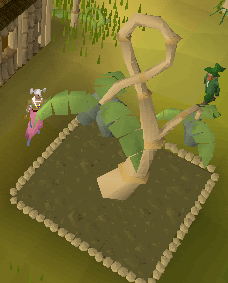 When trying to kill the Vine, it is like in the Quest - level 167. Pros: Are used as payment for Yew Trees. Once you have a fully grown Cactus, you can keep on picking the Spines, and the will regrow until you dig up the plant. Cons: Only 3 Spines will grow at once. Pros: Can be used to make Super Weapon Poison. Cons: Takes a long time to grow, and only has a Yield of 1 Nightshade. If you aren't wearing gloves when you pick it, you will get poisoned with a Poison that hits two damage. Pros: For the large amount of experience that they give, the cost of the Seed is very cheap. Cons: It is a long walk to get to Tai Bwo Wannai to plant it. Pros: Gives the largest experience for any single Crop there is. Once fully grown and the Health checked, you can use it like other Spirit Trees. Cons: The Seeds are untradeable, so you must obtain them yourself. It takes several days to grow. 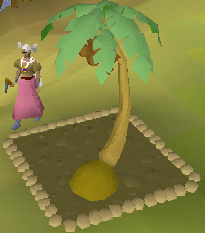 The payment is fairly hard to obtain - the Suqahs are found on Lunar Isle and are level 111, while the shop to buy the Monkey Bar and Nuts is found on Ape Atoll.